New recordings by the Takács Quartet on Hyperion have become important landmarks in the musical calendar. This second disc of Brahms string quartets looks set to repeat all the commercial and critical success of their first. 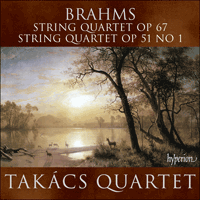 It took twenty years for the famously self-critical Brahms to release his Op 51 string quartets for publication. Despite frequent requests, they were held back until they had reached his requisite standard of perfection. It is clear that Brahms’s struggle with the string quartet medium eventually led him to find an intensely personal language for it, with an unmistakable originality of melody and texture. Op 51 No 1 is both suffused with great musical richness and organically unified, with each idea growing with unerring logic out of the last in a process of continual development, and the main subject of each movement clearly arising out of the same germ. According to Brahms’s friend and one-time piano pupil Alwin Cranz, the composer destroyed more than twenty string quartets before allowing his first pair, Op 51, to appear in print. ‘It’s not difficult to compose’, explained Brahms, ‘but it’s incredibly difficult to get rid of the superfluous notes.’ Cranz may have exaggerated the number of lost quartets (he also claimed that ‘several hundred’ early lieder had met with the same fate), but certainly precious few of the manuscripts Brahms brought with him when he first called at the Schumanns’ house in Düsseldorf, in the autumn of 1853, ever saw the light of day. Among the pile was a string quartet in B minor which Schumann recommended to the publishers Breitkopf & Härtel, with the suggestion that they should issue it as the young composer’s Op 1. As things turned out, however, the always acutely self-critical Brahms destroyed the piece, and a further twenty years were to elapse before he sanctioned the Op 51 quartets for publication. In the event, Brahms dedicated both quartets to Billroth, though the second of them had almost certainly been conceived for Joachim, whose personal motto, ‘Frei aber einsam’ (‘Free but lonely’), is encrypted into its opening theme. That Joachim’s name did not appear on the quartet Op 51 No 2 was perhaps due to the fact that Brahms had recently fallen out with him over a misunderstanding that led to the cancellation of a projected performance of his German Requiem at a Schumann festival in Bonn, of which Joachim was director. None of Brahms’s large-scale works is more organically unified than the C minor Quartet Op 51 No 1. Not only does each idea grow with unerring logic out of the last, in a process of continual development, but the main subject of each movement clearly arises out of the same germ. The dramatic motif hurled forth by all four players at the start of the finale appears to set out in the key—F minor—of the preceding movement, while the rise and fall of its melodic shape echoes the opening movement’s main theme. Moreover, the stepwise progression of the finale’s initial notes recalls the gentle horn-call with which the three lower instruments preface the first violin’s theme at the start of the slow movement. For all their musical richness, it is possible to feel that the orchestrally inclined outer movements are less successful in terms of quartet writing than the two middle movements, both of which are perfect and intimate miniatures. From a harmonic point of view, however, the first movement shows Brahms’s style at its boldest. The tense opening theme, with its pulsating accompaniment on viola and cello, is followed immediately by a more lyrical idea that modulates remarkably widely for so early in the piece. (This was a passage much admired by Schoenberg, who cited it in an essay entitled ‘Brahms the Progressive’.) No less striking is the manner in which Brahms treats the start of the recapitulation, much later in the movement, allowing the main theme to enter before the home key has been re-established. The seamless join is one that effectively prolongs the tension of the preceding development section. The horn-call that inaugurates the slow movement is woven into the accompaniment of the warmly expressive main theme itself. The theme is handed over from violin to cello for a counterstatement, as though it were to form the basis of a set of variations; but there is no such quasi-repeat for the melody’s second half, which instead gives way to the halting phrases of a more pleading middle section. When the original melody returns it does so in an elaborately ornamented form, as if to confirm the variation background of the movement’s beginning. If the ‘panting’ phrases that set the F minor third movement in motion offer a distant memory of the finale from Beethoven’s quartet in the same key Op 95, its second theme—a mellifluous, ‘swaying’ duet for viola and first violin—is as thoroughly Brahmsian as could be imagined. The trio section in the major has its theme accompanied by a curious ‘croaking’ sound from the second violin. The effect is produced by rapidly alternating the same pitch between adjacent ‘open’ and ‘stopped’ strings—an idea Brahms will have learned not from Beethoven, but from Haydn, whose quartets he deeply admired. Haydn’s most famous example of this bariolage technique, as it is called, occurs in the finale of his D major Quartet Op 50 No 6, where its use has lent the work as a whole the nickname of the ‘Frog’. Brahms’s own simile of the Op 67 quartet as being as dainty as Frau Engelmann was apt: in marked contrast to its dramatic predecessors it is a work of considerable charm, and almost divertimento-like playfulness. In composing it Brahms may have had Mozart’s ‘Hunt’ Quartet K458 (also in B flat major) at the back of his mind—at any rate, it, too, begins with a ‘hunting’ theme in 6/8 time. On the other hand, the cross-rhythm that soon appears, dividing the bar into three slightly quicker beats in place of the prevailing two longer beats, is one of Brahms’s favourite gestures. The new rhythm anticipates the ingratiating second subject, with its ‘rocking’ figure, where there is an actual change of time signature, to 2/4. In the exposition’s closing bars, Brahms ingeniously manages to combine the two rhythms. The slow movement has a theme of Mendelssohnian elegance and gracefulness, but there is also a more dramatic middle section that lends the proceedings symphonic tension. Brahms’s autograph score shows us that he initially conceived the piece in a straightforward form, with a conventional reprise in the home key. However, a last-minute change of heart led him not only to cast the concluding section as a variation of the opening melody, but also to launch it in the comparatively distant key of D major, allowing the music to regain the home key of F only shortly before the coda. Perhaps the unexpected switch in tonal direction was prompted by the second half of the initial melody itself, which touches momentarily on the chord of D major. The third movement is the viola solo with which Brahms hoped to tempt Engelmann to change instruments; and in order to make its part stand out, the remaining three players use mutes throughout. As for the finale, it is a piece Brahms clearly remembered when he came to write his Clarinet Quintet in B minor. Like the last movement of that late work, it is cast in the form of a set of variations that gradually works its way around to reintroducing the theme of the opening movement. This, then, like the Clarinet Quintet, and like Brahms’s Third Symphony, is a work whose ending returns us, in circular fashion, to its starting-point. The tiny variation theme itself has a harmonic twist in its tail: its first half cadences unexpectedly into D major, and the sound of B flat is reached again only in its final two bars. The first three variations stick closely to the theme’s harmonic outline, but the fourth turns to the tonic minor, and the fifth is in the closely related key of D flat major. Variation 6 moves into G flat major which means that the harmonic ‘twist’ now occurs on the home key of B flat. This, however, does not lessen the shock of the unceremonious plunge back into B flat for the following variation, where the tempo is doubled and the first movement’s theme reappears. (The implied tempo relationship between the outer movements would seem to dictate a decidedly quick speed for the first movement, if the variations are not to sound too sedate.) Nor is its initial theme the only material from the first movement to make a return at this point: the passage also recalls a mysterious moment in the minor that in the opening movement had heralded the arrival of the second subject. In the closing bars, the variation theme and the first movement’s ‘hunting’ subject are combined with deceptive ease, as though to highlight the hitherto hidden kinship between them. Brahms, au témoignage de son ami et ancien élève de piano Alwin Cranz, détruisit plus de vingt quatuors à cordes avant d’autoriser la parution de son premier diptyque op. 51. «Ce n’est pas difficile de composer, expliqua-t-il, mais c’est fabuleusement difficile de se défaire des notes superflues.» Cranz a peut-être exagéré le nombre de quatuors perdus (selon lui, «plusieurs centaines» de lieder de jeunesse auraient subi le même sort), mais une chose est sûre: de tous les manuscrits que Brahms apporta avec lui lors de sa première visite chez les Schumann à Düsseldorf (à l’automne de 1853), très peu virent le jour. Parmi eux figurait un quatuor à cordes en si mineur que Schumann recommanda aux éditeurs Breitkopf & Härtel, en suggérant de le publier sous le numéro d’opus 1 du jeune compositeur. Mais il s’avéra que Brahms, toujours extrêmement autocratique, le détruisit et vingt années s’écoulèrent encore avant qu’il n’approuvât la publication des quatuors op. 51. Finalement, Brahms dédia ces deux quatuors à Billroth, même si le second avait très certainement été conçu pour Joachim, dont la devise «Frei aber einsam» («Libre mais solitaire») est encodée dans le thème initial. L’absence du nom de Joachim sur le Quatuor op. 51 no 1 s’explique peut-être par le fait que les deux hommes venaient de se brouiller après un quiproquo qui déboucha sur l’annulation d’un projet d’interprétation du Requiem allemand de Brahms, à Bonn, lors d’un festival Schumann dont Joachim était le directeur. Aucune des œuvres à grande échelle de Brahms n’est plus organiquement unifiée que le Quatuor en ut mineur op. 51 no 1. Non seulement chaque idée découle, avec une infaillible logique, de la précédente, en un processus de développement continu, mais le sujet principal de chaque mouvement naît clairement du même germe. Le motif dramatique lancé par les quatre interprètes au début du finale semble démarrer dans la tonalité—fa mineur—du mouvement d’avant, tandis que le flux et le reflux de son dessin mélodique fait écho au thème principal du premier mouvement. Par ailleurs, la progression par degrés conjoints des notes liminaires du finale évoque le doux appel de cor joué par les trois instruments graves avant le thème du premier violon, au début du mouvement lent. Malgré leur richesse musicale, on peut sentir que les mouvements extrêmes, de tendance orchestrale, sont moins réussis, sur le plan de l’écriture de quatuor, que les deux mouvements centraux, qui sont de parfaits et profondes miniatures. D’un point de vue harmonique, cependant, le premier mouvement montre le style brahmsien dans ce qu’il a de plus audacieux. Le thème initial tendu, avec son lancinant accompagnement à l’alto et au violoncelle, est immédiatement suivi d’une idée plus lyrique qui module bien largement, étant donné que nous sommes ici dans la toute première phase du morceaux. (Ce passage fut très admiré par Schoenberg, qui le cita dans un essai intitulé «Brahms le progressiste».) Tout aussi saisissante est la manière dont Brahms traite le début de la réexposition, beaucoup plus tard dans le mouvement, laissant le thème principal entrer avant le rétablissement de la tonalité-mère. La jonction sans heurt prolonge efficacement la tension du développement précédent. L’appel de cor qui inaugure le mouvement lent est inséré dans l’accompagnement du thème principal même, chaleureusement expressif. Ce thème passe du violon au violoncelle pour une contre-exposition, comme pour servir de socle à une série de variations; mais ce genre de quasi-reprise n’existe pas pour la seconde moitié de la mélodie, qui cède la place aux phrases heurtées d’une section centrale plus instante. Lorsque la mélodie originale revient, c’est sous une forme à l’ornementation complexe, comme pour confirmer le fond de variations du début. Si les phrases «haletantes» qui mettent en branle le troisième mouvement en fa mineur rappellent vaguement le finale du Quatuor en fa mineur op. 95 de Beethoven, le deuxième thème—un mélodieux duo «chaloupé» pour l’alto et le premier violon—est brahmsien à souhait. La section en trio, en majeur, voit son thème accompagné par un curieux «coassement» au second violon. Cet effet, obtenu en faisant alterner rapidement la même hauteur de son entre des cordes voisines «à vide» et «touchée», Brahms l’aura appris non de Beethoven mais de Haydn, dont il admirait profondément les quatuors. Le plus célèbre exemple haydnien de cette technique dite de bariolage survient dans le finale du Quatuor en ré majeur, op. 50 no 6—d’où le surnom de «Grenouille» donné à cette œuvre. La comparaison avec la grâcieuse Frau Engelmann était bien vue: tranchant avec ses prédécesseurs dramatiques, l’op. 67 dégage un charme considérable, un enjouement presque de divertimento. En le composant, Brahms pensait peut-être au Quatuor «La chasse» K458 (également en si bémol majeur) de Mozart—en tout cas, son ouverture se fait aussi sur un thème de «chasse» à 6/8. D’un autre côté, le contre-rythme qui surgit bientôt, divisant la mesure en trois temps un peu plus rapides que les deux temps longs, est l’un des gestes préférés de Brahms. Ce nouveau rythme anticipe le deuxième sujet insinuant, avec sa figure «berçante» marquée par un véritable changement de signe de la mesure, à 2/4. Dans les mesures conclusives de l’exposition, Brahms réussit un ingénieux amalgame de ces deux rythmes. Le mouvement lent a un thème d’une élégance et d’une grâce mendelssohniennes, mais il y a aussi une section centrale plus tragique qui confère aux événements une tension symphonique. La partition autographe nous montre que Brahms conçut d’abord cette pièce dans une forme simple, avec une reprise conventionnelle dans la tonalité principale. Toutefois, un ravisement de dernière minute l’amena à transformer la section conclusive en variation de la mélodie inaugurale, mais aussi à la lancer dans le ton relativement lointain de ré majeur, ne laissant la musique retrouver le fa principal qu’un peu avant la coda. Peut-être ce changement inattendu de direction tonale fut-il déclenché par la seconde moitié de la mélodie initiale même, qui effleure momentanément l’accord de ré majeur. Le troisième mouvement est le solo d’alto grâce auquel, espérait Brahms, Engelmann voudrait changer d’instrument; et pour bien faire ressortir cette partie, les trois autres exécutants utilisent une sourdine de bout en bout. Quant au finale, Brahms sut à l’évidence s’en souvenir le jour où il écrivit son Quintette avec clarinette en si mineur: l’un et l’autre affectent la forme d’une série de variations cheminant autour de la réécriture du thème du premier mouvement. Comme dans ce quintette, comme aussi dans la Symphonie no 3, la fin nous ramène donc ici, de manière circulaire, au point de départ. Le minuscule thème de variation présente une inflexion harmonique terminale: sa première moitié cadence, contre toute attente, en ré majeur, et si bémol ne se fait pas réentendre avant les deux dernières mesures. Les trois premières variations collent étroitement au contour harmonique du thème, mais la quatrième vire au mineur de la tonique et la cinquième est dans le ton très voisin de ré bémol majeur. Quant à la variation 6, elle passe à sol bémol majeur, signifiant que l’«inflexion» harmonique se produit désormais sur le si bémol principal. Ce qui n’amortit en rien le choc de la brusque plongée en si bémol à la variation suivante, marquée par un doublement du tempo et par une réapparition du thème du premier mouvement. (La relation de tempo implicite entre les mouvements extrêmes semblerait dicter une allure résolument rapide pour le premier mouvement, si l’on ne veut pas que les variations paraissent trop calmes.) Le thème initial n’est pas le seul matériel du premier mouvement à revenir alors: ce passage rappelle aussi un moment mystérieux en mineur qui, dans le mouvement inaugural, avait annoncé l’arrivée du second sujet. Dans les mesures conclusives, le thème de variation et le sujet de «chasse» du premier mouvement sont combinés avec une aisance trompeuse, comme pour mettre en lumière leur parenté, jusque-là cachée. Laut Brahms’ Freund und ehemaligem Klavierschüler Alwin Cranz zerstörte der Komponist mehr als zwanzig Streichquartette, ehe er dem Druck seines ersten Paares, op. 51, zustimmte. „Es ist nicht schwer, zu komponieren“, erklärte Brahms, „aber es ist fabelhaft schwer, die überflüßigen Noten unter den Tisch fallen zu lassen.“ Cranz mag die Anzahl der verlorenen Quartette übertrieben haben (er behauptete auch, dass „einigen hundert“ frühen Lieder das gleiche Schicksal widerfahren wäre), doch kamen tatsächlich nur herzlich wenige von den Manuskripten ans Tageslicht, die Brahms bei seinem ersten Besuch im Düsseldorfer Haus der Schumanns im Herbst 1853 mitgebracht hatte. Im Haufen befand sich auch ein Streichquartett in h-Moll, das Schumann dem Verleger Breitkopf & Härtel mit dem Hinweis empfahl, es als op. 1 des jungen Komponisten zu veröffentlichen. Wie es sich allerdings herausstellte, zerstörte der stets äußerst selbstkritische Brahms das Stück, und weitere 20 Jahre sollten vergehen, bis er seine Zustimmung zur Veröffentlichung der Quartette op. 51 gab. Schließlich widmete Brahms beide Quartette Billroth, auch wenn das zweite mit höchster Wahrscheinlichkeit für Joachim entstanden war, dessen persönliches Motto „Frei aber einsam“ im ersten Thema verschlüsselt ist. Der Grund für das Ausbleiben von Joachims Name im Quartett op. 51 Nr. 2 lag womöglich darin, dass Brahms sich kurz zuvor mit Joachim verstritten hatte aufgrund eines Missverständnisses, das zur Streichung einer geplanten Aufführung des Deutschen Requiems bei einem Schumann-Festival in Bonn führte, dem Joachim als Direktor vorstand. Keines von Brahms’ groß angelegten Werken ist motivisch-thematisch enger verknüpft als das Quartett op. 51 Nr. 1 in c-Moll. Hier wächst nicht nur jeder musikalische Gedanke vermittels eines Prozesses ständiger Durchführung mit unfehlbarer Logik aus seinem vorangegangenen heraus, sondern auch die Hauptthemen der Sätze stammen offensichtlich aus dem gleichen Kern. Das von allen vier Spielern zu Beginn des Schlusssatzes herausgeschleuderte dramatische Motiv scheint in der Grundtonart des vorangegangenen Satzes—f-Moll—fortzusetzen, während der melodische Auf- und Abstieg des Motivs das Hauptthema des ersten Satzes in Erinnerung ruft. Zudem mahnt der schrittweise Verlauf der Anfangsnoten im letzten Satz an den sanften „Hornruf“, mit dem die drei tieferen Instrumente das Thema der ersten Violine zu Beginn des langsamen Satzes ankündigen. Trotz des musikalischen Reichtums der Außensätze mag man den Eindruck bekommen, als würden diese sich einem Orchesterklang nähernden Sätze als Quartettschöpfungen weniger überzeugen als die zwei mittleren Sätze, die beide perfekte und persönliche Miniaturen darstellen. Von einem harmonischen Standpunkt aus gesehen wagt sich Brahms’ Stil allerdings am meisten im ersten Satz vor. Das gespannte erste Thema mit seiner pulsierenden Begleitung aus Bratsche und Violoncello wird sofort von einem lyrischeren musikalischen Gedanken gefolgt, der erstaunlich umfangreich moduliert, wenn man bedenkt, wie früh im Stück man sich hier befindet. (Schönberg bewunderte gerade diese Passage sehr und zitierte sie in seinem Aufsatz „Brahms, der Fortschrittliche“.) Nicht weniger auffällig ist die Art, mit der Brahms viel später im Satz den Anfang der Reprise gestaltet, wo er das Hauptthema schon einsetzen lässt, noch bevor die Grundtonart erneut befestigt wurde. Der nahtlose Übergang hält so die Spannung des vorangegangenen Durchführungsabschnittes wirksam bei. Der den langsamen Satz einleitende „Hornruf“ fließt in die Begleitung des gefühlvoll ausdrucksstarken Hauptthemas ein. Das Thema wird von der Violine für ein Gegenthema zum Violoncello weitergereicht, als solle es die Grundlage für eine Variationsreihe bilden. Die zweite Melodiehälfte findet für diese Vorspieglung allerdings keine Wiederholung, sondern fällt zugunsten der zögernden Gesten eines flehenderen Abschnitts weg. Wenn die ursprüngliche Melodie dann erneut erklingt, geschieht das in einer umfangreich verzierten Art und Weise, als sollte die zu Beginn des Satzes geschaffene Illusion einer Variationsreihe bestätigt werden. Die „keuchenden“ Phrasen, die den dritten Satz, in f-Moll, in Bewegung setzen, mögen einen fernen Anklang an den Schlusssatz aus Beethovens Quartett op. 95 in der gleichen Tonart enthalten, doch könnte das zweite Thema—ein süßes, „schunkelndes“ Duett für Viola und erste Violine—nicht typischer für Brahms sein. Der in Dur gehaltene Trioabschnitt hat ein Thema, das von einem merkwürdig „quakenden“ Klang der zweiten Violine begleitet wird. Die Wirkung entsteht durch den sehr schnellen Wechsel zwischen einem Ton, der auf einer „leeren“ Saite gespielt wird, und dem gleichen Ton auf einer „abgegriffenen“ Saite—ein Einfall, den Brahms wohl nicht von Beethoven, sondern von Haydn gelernt haben mag, dessen Quartette er zutiefst bewunderte. Haydns berühmtes Beispiel dieser Bariolage-Technik, wie man sie nennt, geschieht im Schlusssatz seines Quartetts op. 50 Nr. 6 in D-Dur, wo ihr Einsatz zur Namensgebung des gesamten Quartetts als „Froschquartett“ führte. Brahms’ Beschreibung seines Quartetts op. 67 als so niedlich wie Frau Engelmann war ein treffender Vergleich: Im deutlichen Gegensatz zu den dramatischen Vorgängern des Werkes zeichnet sich dieses Quartett durch beachtlichen Charme sowie durch eine fast wie ein Divertimento klingende Verspieltheit aus. Beim Komponieren hat Brahms vielleicht auch an Mozarts „Jagdquartett“ KV458 (also in B-Dur) gedacht—wie dem auch sei, auch das beginnt mit einem „Jagdthema“ im 6/8-Takt. Andererseits gehört der bald auftauchende Gegenrhythmus, der den Takt in drei etwas schnellere anstatt der vorherrschenden zwei langsameren Schläge unterteilt, zu Brahms’ Lieblingsgesten. Der neue Rhythmus nimmt das einschmeichelnde zweite, sich durch eine Schaukelfigur auszeichnende Thema vorweg. Bei diesem Thema geschieht ein richtiger Taktwechsel zum 2/4-Takt. In den abschließenden Takten der Exposition gelingt es Brahms geschickt, die zwei Rhythmen zu kombinieren. Der langsame Satz hat ein Thema von an Mendelssohn mahnender Eleganz und Anmut, allerdings gibt es auch einen dramatischeren Mittelteil, der dem Verlauf sinfonische Spannung verleiht. Brahms’ handschriftliche Partitur zeigt uns, dass er das Stück ursprünglich in einer einfachen Form mit einer konventionellen Reprise in der Grundtonart konzipiert hatte. Doch eine Sinnesänderung in letzter Minute veranlasste ihn nicht nur, den letzten Abschnitt als eine Variationsreihe über die einleitende Melodie zu komponieren, sondern damit auch in der verhältnismäßig entfernten Tonart D-Dur zu beginnen, wodurch der Musik erst kurz vor der Koda gestattet wird, zu ihrer Grundtonart F-Dur zurückzukehren. Vielleicht wurde der unerwartete tonale Richtungswechsel durch die zweite Hälfte der ursprünglichen Melodie hervorgerufen, die zeitweilig den Akkord D-Dur anklingen lässt. Der dritte Satz ist das Bratschensolo, mit dem Brahms hoffte, Engelmann zum Instrumentenwechsel zu bewegen. Um diese Bratschenstimme hervorzuheben, spielen die übrigen drei Streicher durchgängig mit Dämpfern. Der Schlusssatz wiederum erweist sich als ein Stück, an das sich Brahms eindeutig erinnerte, als er sein Klarinettenquintett in h-Moll schrieb. Wie der letzte Satz dieses späteren Werkes ist auch das Finale von op. 67 eine Variationsreihe, die allmählich auf eine Wiedereinführung des Themas aus dem ersten Satz zuarbeitet. Man hat es hier also wie beim Klarinettenquintett und bei Brahms’ dritter Sinfonie mit einem Werk zu tun, dessen Schluss uns kreisförmig wieder zum Anfang zurückführt. Das winzige Variationsthema enthält selber eine harmonische Verwicklung: Seine erste Hälfte kadenziert unerwartet nach D-Dur, und der Klang des B-Dur wird erst wieder in den letzten zwei Takten erreicht. Die ersten drei Variationen halten sich eng an die harmonische Kontur des Themas, doch die vierte wendet sich zur Mollvariante der Tonika. Die fünfte steht in der eng verwandten Tonart Des-Dur. Variation 6 bewegt sich nach Ges-Dur, wodurch die harmonische „Verwicklung“ nun in der Grundtonart B-Dur erklingt. Das dämpft allerdings nicht den Schock über den unsanften Sprung zurück nach B-Dur für die folgende Variation, wo das Tempo verdoppelt wird und das Thema des ersten Satzes wiederkehrt. (Die implizierte Tempoverwandtschaft zwischen den Außensätzen würde ein äußerst schnelles Tempo für den ersten Satz verlangen, wenn die Variationen nicht zu träge klingen sollen.) Noch ist das Anfangsthema das einzige Material aus dem ersten Satz, das an dieser Stelle wiederkehrt: Die Passage erinnert auch an den mysteriösen Moment in Moll, der im ersten Satz die Ankunft des zweiten Themas angekündigt hatte. In den abschließenden Takten werden das „Jagdthema“ des ersten Satzes und das Variationsthema mit täuschender Leichtigkeit kombiniert, als hebe man hier die bis dahin versteckte Verwandtschaft hervor.